Accompanying the religious leaders was filmmaker Marty Ostrow and a film crew with the Renewal Project. They documented the trip and produced an 11-minute segment titled A Crime Against Creation that became part of a longer film, RENEWAL: Stories from America’s Religious-Environmental Movement. The film has shown on American Public Televisionand at screenings and conferences throughout the United States. It is available for purchase on DVD. Some of the religious leaders on the tour shared their experiences during a program with the Interfaith Alliance of the Bluegrass. Read about it here. 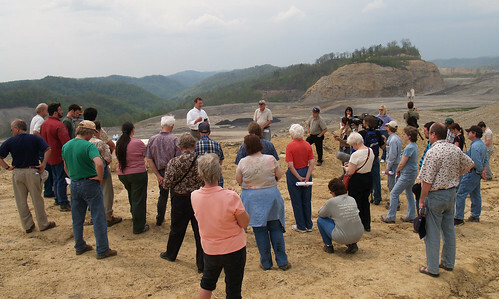 On May 1-2, 2007, KFTC and the Catholic Committee of Appalachia sponsored a tour of mountaintop removal for pastors and other religious leaders from Kentucky and several national evangelical leaders in the United States. The tour included a visit to the home of Daymon and Betty Morgan in Leslie County, a flyover of mines sites in Perry County, listening to community testimony in Hindman and a concluding prayer service on a mountaintop (or the half that's left) in Montgomery Creek, hosted by the Kodak Church of God. In response to what they heard and saw, the leaders drew on their various faith traditions and prepared the following statement, which was signed and released during the concluding prayer service. Representatives of many faith traditions were invited to participate on the May 1-2, 2007, Mountaintop Removal Tour for Interfaith Leaders. In fact the participants included representatives from many branches of the Christian tradition and one member of the Baha’i faith. The following document should be read with this understanding. However, we hope it will also be an invitation to people of all faiths to become involved and to take action. As people of faith from varied religious traditions, we assembled in the Central Appalachian coalfields to hear the pleas from local people. Many of our brothers and sisters, living in the midst of natural beauty and extensive mineral wealth, do not share the abundance of the land, but instead experience their lives endangered and their area threatened by mountaintop removal. Local residents told us that mountaintop removal damages the foundations of their homes and destroys the wells in nearby communities. We heard the story of a mother who has only poisoned water with which to bathe her child. We saw millions of tons of earth and rock dumped into valleys, ruining springs and headwaters of creeks essential to the animal and plant life for miles downstream. We saw water flowing orange with acid runoff, seeding the ground with volatile organic contaminants. We heard stories of graveyards and home places destroyed, altering communities reverenced for generations by families who trace their ties to that land. Central Appalachia is a land of contrast. The rich beauty of creation stands next to the stark destruction of mountaintop removal. The wealth of coal companies stands beside the utter poverty of the people who have worked to make these companies successful and whose land contains these riches. We confess the role our own demand for cheap energy from coal has played in the destruction of creation and the impoverishment of the people of Central Appalachia. Care of creation represents a common thread for all people of faith. In the Judeo-Christian tradition, this care represents a spiritual act. God owns the land and trusts us to be responsible stewards. The Hebrew Psalmist says: “The earth is the Lord’s and the fullness thereof, the world and those who dwell therein” (Ps. 24:1). We remember that God finished the work of creation and “found it very good” (Gen. 1:31.) God put humanity in the Garden of Eden, a symbol of the whole world, “to cultivate and care for it” (Gen. 2:15.) Hence, creation reflects the beauty of God and humanity becomes a caretaker with God. From our observations and the testimony of many, we conclude that mountaintop removal destroys God’s garden. In addition, because God’s covenant of protection “covers every living creature,” decisions about the earth’s use must be determined by a concern for the common good. That common good also extends to future generations that must solve their problems, as we solve ours, with the finite resources God has given. Future generations may find their choices greatly limited because of expedient decisions made by our own generation. We pray that society will produce its necessary goods and services without destroying creation. Unfortunately, our reckless patterns of consumption exploit both land and workers in a rush for quick profit. Society must reject the false dichotomy of jobs versus the environment and creatively find ways of preserving God’s creation while allowing workers of mountain communities to earn their livelihoods. First, each of us will examine our own wasteful and extravagant lifestyle that causes the destruction of the mountains by demanding cheap energy from coal. Our unexamined and often frivolous consumption has blinded us to the consequences of those demands on creation and the people of the coalfields. Second, we will insert mountaintop removal into the growing conversation about global climate change. Third, we pledge voice and vote against mountaintop removal. Our voices will retell the testimony we have heard and the destruction we have seen through our sermons, writings, and conversations. We will raise awareness of mountaintop removal’s devastation in our places of worship and community gatherings. Then, through the legitimate political process, we will encourage our elected officials to enforce fully the existing regulations that ensure clean water and air, while we join others demanding a ban of mountaintop removal as a method of mining. Fourth, as people of faith we will make this a spiritual issue in our own lives and invite the members of our faith communities to do likewise. This involves engaging people’s conscience towards moral action and praying with the people of Central Appalachia. We return to our homes enriched by the beauty of the mountains and their inhabitants, determined to live more fully with care of creation. As we travel through these mountains, these words sing in our hearts: “May the glory of the Lord endure forever; may the Lord be glad in these works!” (Ps. 104:31).